Well, imagine my surprise to find that it's been OVER A YEAR since I last wrote or pictured anything here!! (No wonder I have so very few followers). 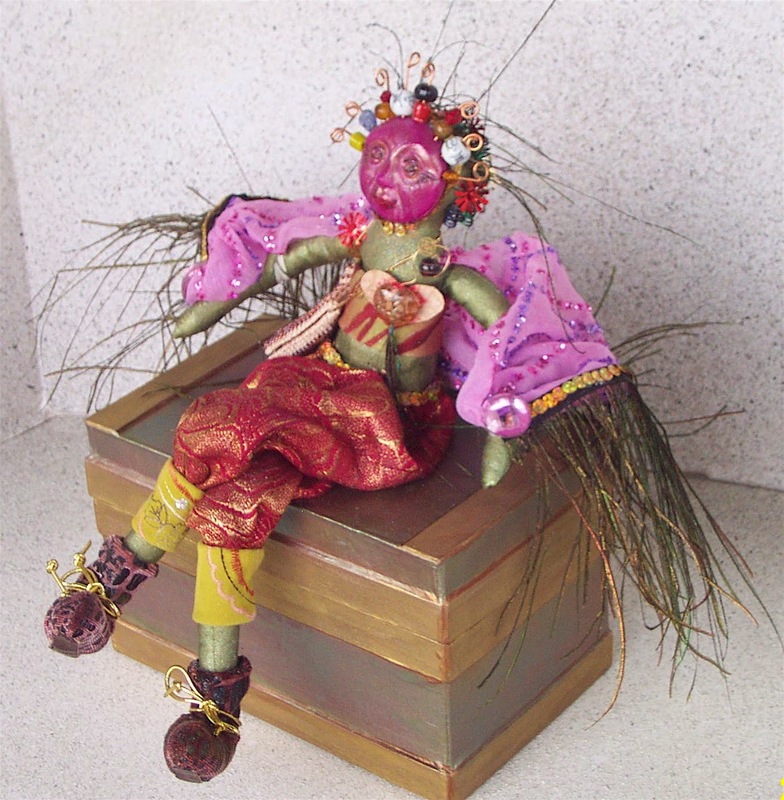 It is now May 9, 2016 and we enjoyed the Quinlan Philadelphia ArtDoll/ArtBear Show and Sale. The show continues to be my "eye candy" of creative ideas. This year's gallery piece depicted the TOTEM with some unique "critters" and beads. Created using imported mohair as well as antique/vintage upholstery mohair. The wooden base was painted, then used "crackle" technique to give the idea of age-ing. Strung beads added to the totem idea. The "Ides of March"....HAH! Winter Marches On! We're almost through March.....my least favorite month. (It used to be August, when I was a school teacher). It seems like WINTER will never leave us this year. I've had a hard time concentrating on any new creative ideas, and seem to want to be some place else.....Wherever I'm not! We have created some new things, which I shall post here soon, after I've done the photo shoot. The bears are smaller this year and seem to be more traditional....not too much glitz or glitter, but I do believe that I am satisfied with them. Some "oldies" will be getting new looks, as soon as the four foot drift melts that keeps me from the storage barn. 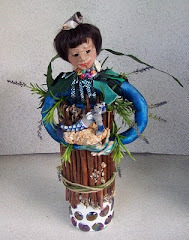 I am so looking forward to the Quinlan Art Doll and Artist Teddy Bear show this year first weekend in May. In the mean time, here's a couple of Maggie's Creations that have not been seen before. The top piece is called "Maggie @ 61"....notice the roller blades: that means that Maggie is still goin' strong. These will become a statement on many new figurative sculpture pieces to come. The bottom photo is titled "It Ain't Easy Being Green", a take off on the Randy Newman song of the same title. Great T-I-C. (tongue in cheek) Both these pieces are in private collections. 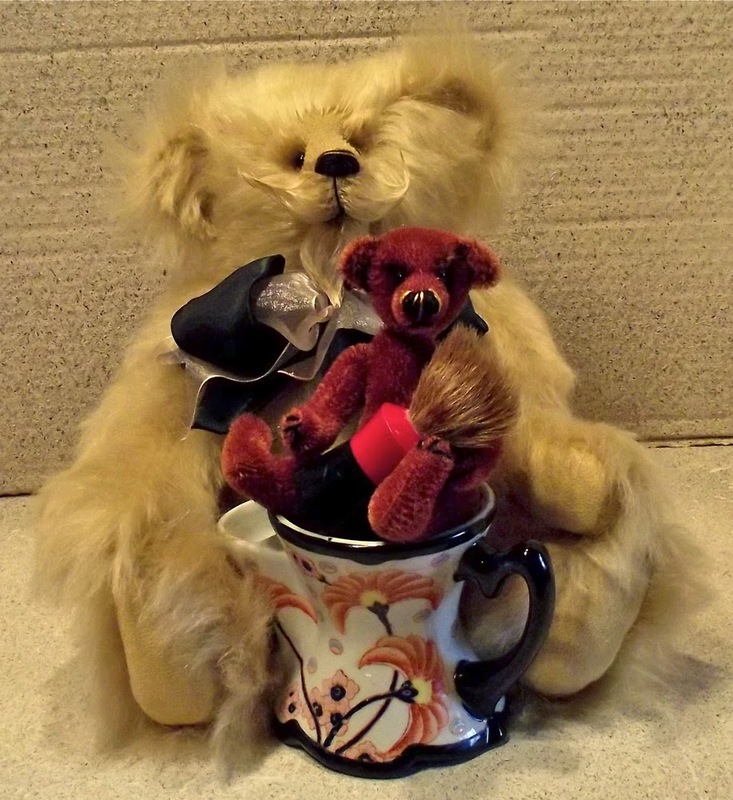 Art Bear and Art Doll Totems! 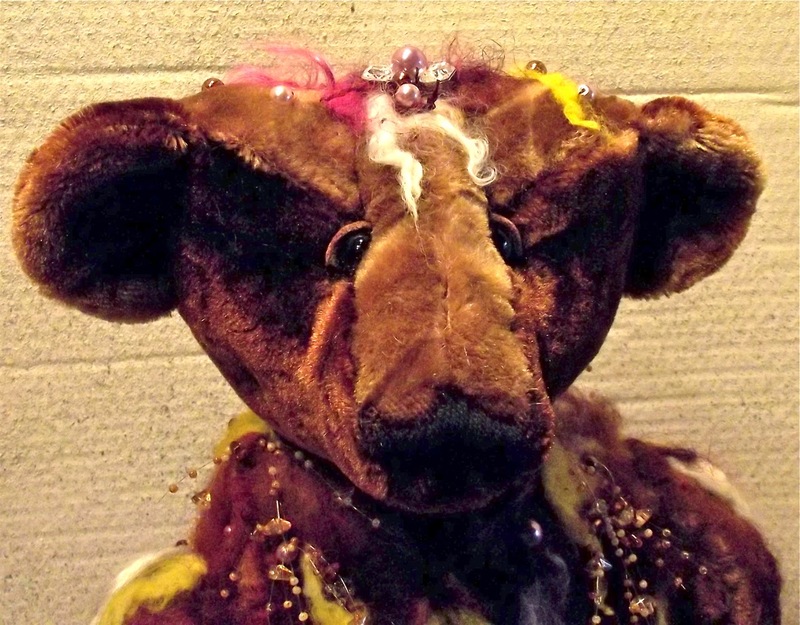 The bear is 26 inches, created from an antique carriage robe (rayon, I believe), that I hand dyed, since I did not truly like the taupe color of the carriage robe. If I create more using this fabric, I shall use "color remover" (Rit) before I try to dye this, since the color I had in my mind did not show up! However, I LOVE reds, so I am happy with the result. I do not intend to retail this piece; it's for ME to remind me of the wonderful times/shows in which I have sold my art work. 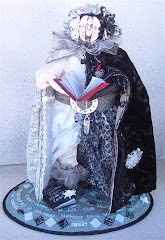 I believe this challenge would be fun for many who have fallen in love with the creativeness of art dolls and art bears. 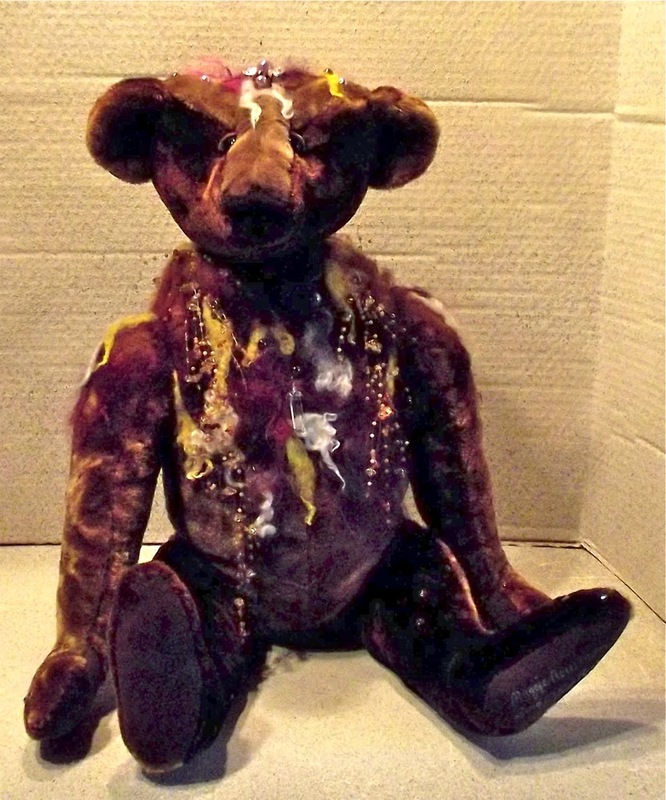 I also did the Teddy Bear Artists International show in Binghamton, NY in August 2014. Shown below is my Art Gallery piece depicting my 20 years of memories from TBAI. 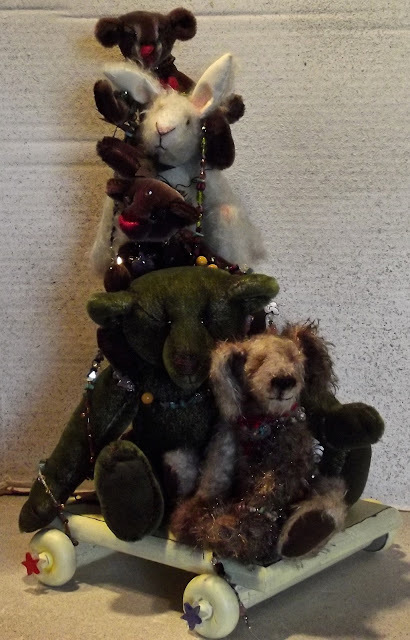 Several small bears in an antique cart showing various gallery pieces created over the years by Maggie's Creations. One-Of-A-Kind piece, which is what i so enjoy doing. I finished the photo shoot this am. I need more "how-to-photo-the work" instruction; IPhoto does not seem to work too well in clarifying details of the bear creations, etc. If the bears are dark, the details do not show well at all, even when I "adjust" the software. Something I need to work on for sure. Anyway, here's some more creations for the Philadelphia, PA show....MUCH BETTER when seen in person!! 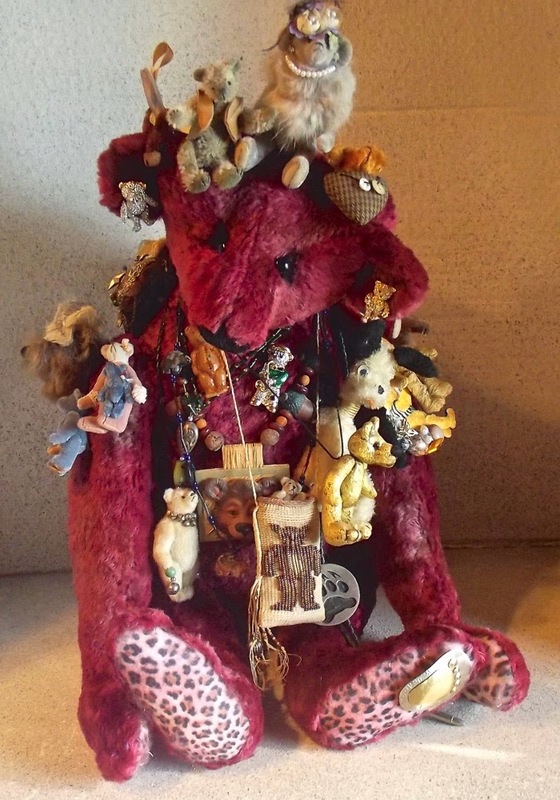 This is the "2014 Artist Bear" created from vintage wool carriage robe... variegated brown tones....large bear 26 inches decorated with glittery jewels and crystals. I used the needle felting machine to add various colors of roving, mohairs, then used hand needles to finish it off. 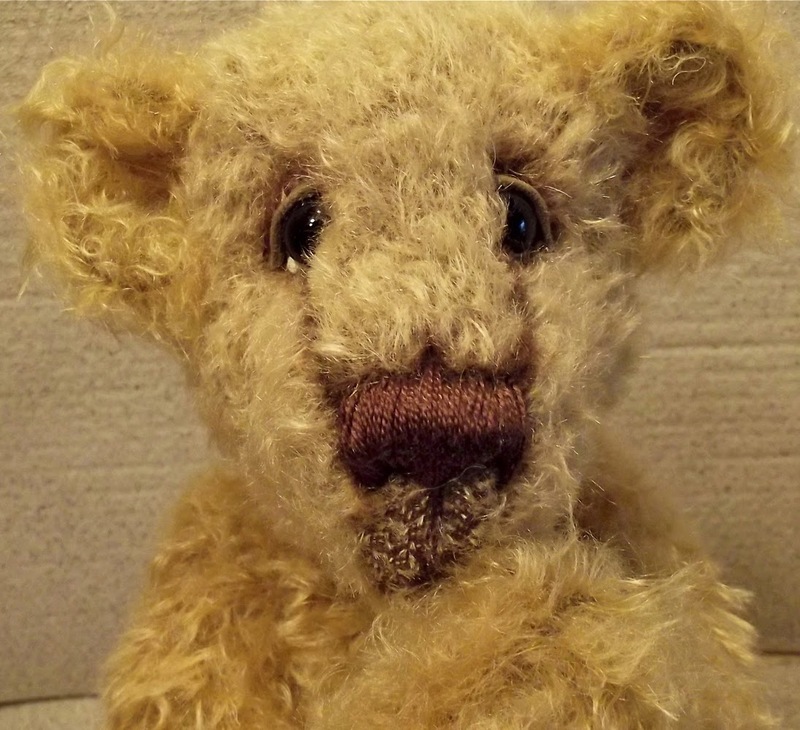 I am very pleased, though this photo does not do this bear justice! 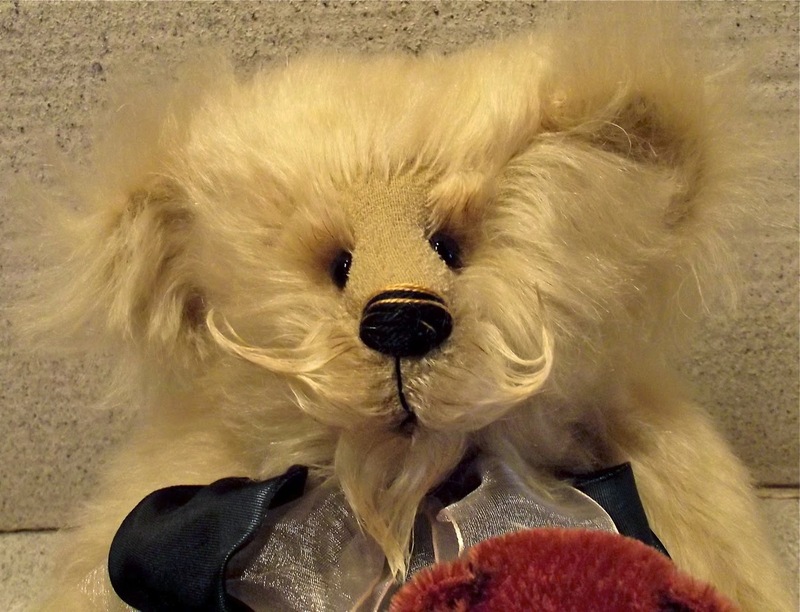 This is "Harry L and the Barber 2014" created from LONG mohair fur to create eyebrows, mustache, and goatee. The little guy (the barber?? 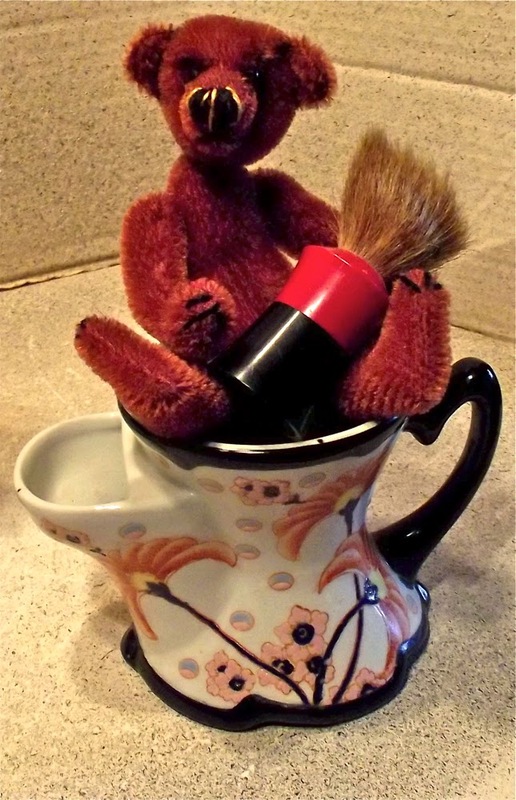 You decide who's who) is sitting on an antique mustache cup with his own shaving brush. This is "Rufus" a self-standing bear created from 2 different mohair furs. An original pattern....Love this guy!